In today’s world where medical breakthroughs are occurring every day, nurses caring for patients in an acute care environment must be familiar with the latest treatments, procedures and medications in their specialties so that they can provide the highest level of care. To meet this need, advanced degrees, such as bachelor’s, master’s and doctorates in nursing, and nurse practitioner designations, and credentialing programs in specialized fields such as critical care, cardiac, orthopaedics, women’s health, and cancer treatment are available for registered nurses to continually expand their knowledge and expertise. 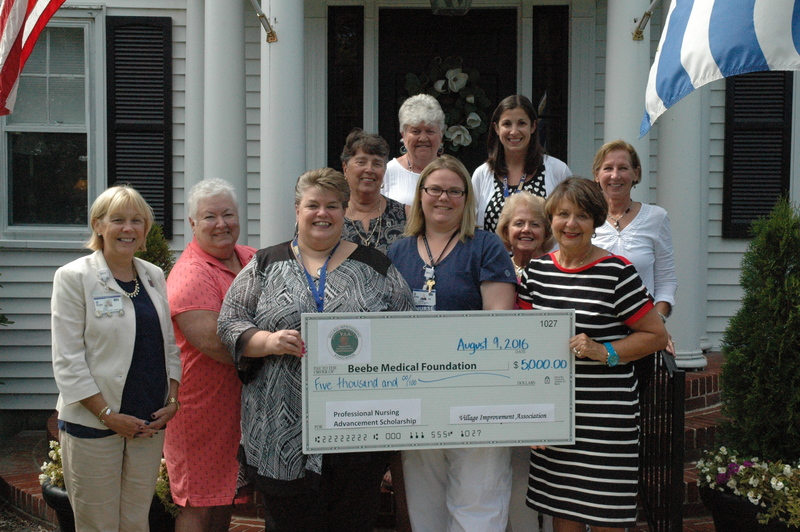 The Village Improvement Association of Rehoboth Beach has created a new, $5,000 annual scholarship for a registered nurse (RN) at Beebe Healthcare who is pursuing advanced education through one of these recognized programs. VIA President Rose Marie Patin, MSN, RN, flanked by VIA members Gail Shaffer, Mary Folan, Veronica Lutz, RN, Carole Suchanek, RN, and Kate McKenzie, presented a check for $5,000 to Jennifer L. Hargreaves BA, MSN, RN, NE-BC, manager of the Educational Institute (BHEI) at Beebe Healthcare; Laura Smith, MSN, RN, CNE, clinical educator at Beebe; and Judy Aliquo, CFRE, President and CEO of Beebe Medical Foundation, Beebe’s fundraising arm. The VIA, established in 1909, has a vision to improve and increase the intellectual culture, educational advancement and continued moral development of its members by promoting the interest, improvement and progress of Rehoboth Beach and by performing charitable and civic work in the greater Rehoboth Beach area. In 2015, its 235 members volunteered nearly 35,000 hours and donated more than $51,000 to local and national beneficiaries. Nurses at Beebe Healthcare gain continual clinical education opportunities onsite through the organization’s Educational Institute (BHEI). Beebe provides tuition reimbursement each year for education directly related to the clinical professional’s work, though the reimbursement does not cover the entire cost of education. Beebe also recognizes six nurses each year who provide high quality care through its Nursing Excellence Award program. Nurses are in the process of applying for the scholarship and the name of the nurse to receive the award will be announced later this fall. Caption: Pictured here, left to right, back row: Judy Aliquo, President and CEO of Beebe Medical Foundation; Gail Shaffer; Helen Ball; Mary Folan; Veronica Lutz, RN; Carole Suchanek; and Kate McKenzie. Front row, left to right, are Jennifer Hargreaves and Laura Smith receiving the check for $5,000 from VIA President Rose Marie Patin. Village Improvement Association (VIA) is a philanthropic organization with the objective to improve and increase the intellectual culture, educational advancement and moral development of its members; to further and promote the interests, improvements and progress of Rehoboth Beach, Delaware; and to do and perform whatever charitable and civic work at Rehoboth Beach and elsewhere as may from time to time be decided upon by our members. For more information, please visit our website at https://www.rehobothbeachvia.org/.